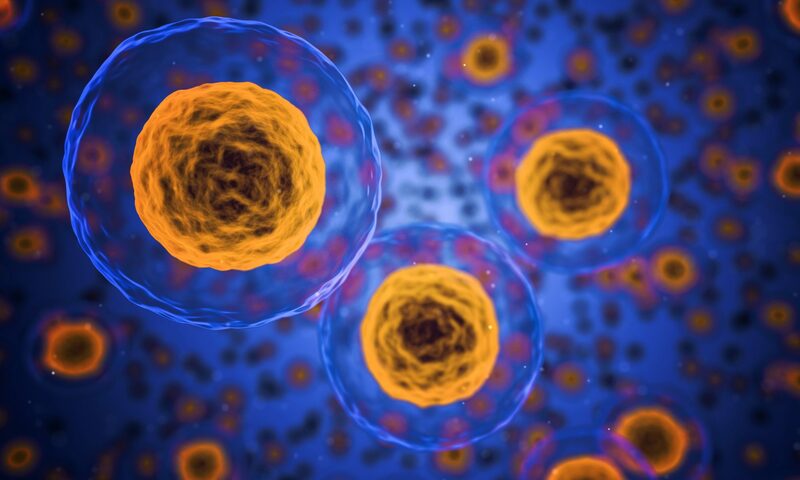 The human body is built out of trillions of cells. In every cell, hereditary properties are stored in the form of DNA (deoxyribonucleic acid). DNA are long double helical structural molecules, which are wrapped around histones to be compressed into chromosomes. There are 23 pairs of chromosomes, where one comes from the father and one comes from the mother. DNA contains the code where all the hereditary properties are defined. A piece of DNA which contains one specific hereditary property is called a gene. Every gene carries the code of one of the many proteins in our body. Functions these proteins can exert are catalyzing chemical reactions (enzymes), transmitting signals throughout the body (hormones) or building up cells. Different kind of genes form different kind of proteins, which determine our specific properties, like the color of hair or eyes. When a crucial gene is not working properly, one can become sick. A genetic defect can be innate or can develop during life due to hazardous factors like UV-radiation or smoking. When crucial genes are harmed, one can develop cancer. Gene therapy is a form of medicine where genetic material is brought into human cells. Cells who have received a new gene can produce proteins who previously were missing or were not functioning properly. First, gene therapy was focused on metabolic diseases, because in these diseases a defect in only one gene was the cause of missing a specific enzyme. By repairing the gene or bringing a healthy version of the gene into the cells, these diseases can be cured. Recently, a lot of attention is made for complex diseases like cardiovascular disorders and cancer, where gene therapy can deliver extra genes into the cells who can function as a medicine. A new gene needs to be delivered into the right cells to be translated to create the right proteins. A mean of transport is needed to deliver the gene into the right cells, which is called a vector. Viruses are being used a lot as vectors, because viruses are specialized in entering a cell and expressing their genes in that cell. Furthermore, some viruses can build their genes into the chromosomes of the cell, which makes the effect of these genes permanent. There are also other methods to deliver the genes into a cell. This can be done without a vector (called ‘naked DNA’) or via artificial made lipid vesicles (called ‘liposomes’).